Belize is now one of the world's leading ecotourism destinations, offering swathes of untouched rainforest, mangrove coasts, and one of the most splendid coral reef in the western hemisphere, second only in size and grandeur to Australia's Great Barrier Reef. Add to that ancient monuments (over 900 ancient Mayan ruins are located in the country) and fantastic beaches and you have an ideal family adventure destination. Experience the historic and living culture of the Maya as we travel through jungles to discover ancient pyramids, visit local markets, stay on tropical islands and jungle lodges and appreciate its magnificent and well preserved natural history. We include two tropical islands on this trip. On the Caribbean Island of Caye Caulker, we have the opportunity to relax and snorkel with a wide variety of marine life including stingrays and turtles on the largest barrier reef in the western hemisphere. We also spend a night on Tobacco Caye, staying in delightful rustic beach front cabins where you can wake up to the sound of the ocean breaking. Land only clients arrive to Belize City and check-in at hotel. Belize City was the capital of Belize until 1970 at which time it moved to Belmopan and is a typical Caribbean town. Parts of the town are still largely built of wood and galvanised iron, with many of the original colonial style houses in an elegant state of disrepair. There is also a canal system through the old part of town and a hand cranked colonial swing bridge that spans the Haulover creek separating the north and south side of the city from where the local lobster fishing boats and canoes depart. Creole English is widely spoken. Clients on the group flight from London will spend this first night in the United States, usually in Houston. Free morning in Belize City. Heading along the northern highway, we pick up those joining from London at the international airport, before continuing to the Community Baboon Sanctuary. Here we have a chance of up close encounters with the world's second loudest land mammal - the Yucatecan black howler monkeys in their natural habitat and learn about the close relationship these animals have with local people who benefit from their protection - confusingly the local people call the monkeys 'baboons'. Later in the afternoon travel inland to the Crooked Tree Wildlife Sanctuary, an important wetland habitat. Settle down for two nights enjoying the hospitality of our local hosts on the shores of the Crooked Tree Lagoon. Established in 1984, this maze of waterways and lagoons supports a wonderful variety of wetland species. For our first close up encounter with Belize's famed wildlife it's possible to use the hotels kayaks for an afternoon paddle in the lagoon. If the weather is fine we may take a sunset cruise on the lagoon in search of Green Iguanas and numerous wetland species including several species of kingfisher, heron, waders and raptors. If we failed to do the sunset cruise yesterday we can rise early this morning to explore the lagoon by boat. In this birdwatchers paradise we may spot wood stork, boat-billed heron, vultures, kingfishers, grebes, hawks, snail kites, jacanas and, perhaps most notable of all, the rare jabiru - the largest flying bird in the hemisphere with a wingspan of up to 4 metres. Over 250 resident and migratory bird species have been spotted in the park. Returning to the lodge for breakfast, this morning we venture by vehicle to the New River and Tower Hill bridge for the boat ride upstream to the 2000 year old jungle ruins of Lamanai, one of Belize's largest Mayan ceremonial centres. Water birds are abundant in this ancient rainforest and freshwater crocodiles may be spotted lurking along the river bank. Lamanai, the original name of these Maya ruins, means 'Submerged Crocodile', which helps to explain the numerous carved crocodile representations at the site. The ruins are only partially cleared; most of the structures are still consumed by the surrounding rainforest with its thick canopy of huge trees, in total 718 known structures have been uncovered. The humid atmosphere adds an aura of mystery to the scattered and overgrown relics and there is some evidence that the Maya practised human sacrifice here. We return to our lodge mid-afternoon. For keen bird watchers you won't have to venture far from the lodge, the lake hosts an abundant population of neotropical birds, just fifty feet from the lodge. This morning we make a short excursion on foot to explore Crooked Tree further. This was one of the first settlements the British made in the area in the early 17th century. Testimony to this is the many Scottish titles and surnames that still exist. The extraction of logwood for textile dyes is what brought the original settlers here and we can still see the logwood tree growing commonly along the shores today. We bid farewell to the reserve mid-morning, heading by bus to San Ignacio, a traditional Belizean town. Straddling the Macal River, once a critical transportation artery for the Maya and later the European settlers, it is now a centre for visiting ancient Mayan sites making it an ideal place to base ourselves for the next couple of days. Our base is a resort just ten minutes outside of San Ignacio, featuring individual cottages, beautiful landscaped gardens and a swimming pool. The afternoon has been left free to enjoy the pool or head into town to explore. Today we make a visit to the great classical Maya site of Xunantunich, Mayan for 'Rock Stone Maiden'. We travel the short distance to the area by bus, crossing the River Macal by traditional hand-winched ferry to arrive at the site. Occupied until about 850 AD, the main plaza is dominated by an awesome structure called El Castillo - a massive pyramid which rises to 40 metres. On the top is a partially restored stucco frieze representing the Sun God and astronomical signs of the Moon and Venus. The views are superb view from the summit, looking out over the forest with the Maya mountains to the south and the lowlands of Guatemala to the west. The afternoon is free once again to explore the local area, including the Mayan underworld on an optional cave canoeing adventure, see the optional excursions section for more details. San Ignacio is at the heart of Belize's (small) inland tourism and offers many different activities. Today you can choose from several different optional tours in the surrounding area. The UNESCO World Heritage Site of Tikal just over the border in Guatemala is one of those options. Set in one of the America's greatest forest reserves known as "The Maya Biosphere", Tikal and the surrounding forest are also home to many endangered animal species that are often seen here, living amongst one of the most impressive archaeological sites in the world. Abandoned in the 10th century and rediscovered 900 years later, this huge site lies amongst an example of more than 1000 years of undisturbed tropical forest regrowth. The ancient site provides an atmospheric backdrop to some superb wildlife spotting; it's possible to spot hummingbirds flycatchers and honeycreepers, all to the chorus of Howler Monkeys roaring in the distance. Other optional tours include a visit to the archaeological site of Cahal Pech. You may instead wish to visit the Belize botanical gardens and jungle lodge where we can tour the gardens, lunch, and then paddle back to San Ignacio along the Macal River, rich in birdlife, butterflies and iguanas; alternatively simply relax at the hotel pool. Today we head south along one of Central America's most scenic roads - the Hummingbird highway. Our first stop will be at the Blue Hole National Park operated and run by the Belize Audobon conservation society. Broad leaf semi deciduous rainforests cover the limestone cliffs with a network of cave complexes hidden amongst the rich vegetation. Subject to local conditions, we aim to visit a large cave complex and swim in a crystal clear limestone sink hole surrounded by lush jungle. Continuing along the highway through orange and cacao groves we make a break at a local organic farm and tree planting project for lunch, it's an opportunity to learn about local food products and may even plant a tree to help to keep Belize green. Our final destination is the tropical island of Tobacco Caye, located ten miles off the coast, a 20 minute boat ride from Dangriga Town. As one of the smallest island in Belize, Tobacco Caye has an intimate, relaxed feel with a host of activities to choose from. We stay in cabins right on the reef's edge overlooking the ocean at the delightful Joe Jo's by the reef resort, a laid back collection of brightly coloured characterful beach cabins. Each cabin has a private deck complete with a hammock to sit back and relax with the sounds of the waves breaking in front of you. Tobacco Caye measures just 200 feet wide and 400 feet long. Optional trips include visiting the small coral cayes, such as Bird Island a renowned local bird sanctuary. There are excellent snorkeling opportunities in the World Heritage Site of the Belize barrier reef system off the island as well as fishing tours, manatee watching and tours to nearby islands. A full list of costs of these activities is provided in the optional excursion section. Alternatively you can play beach volleyball, use one of the hotels kayaks or simply unwind in a hammock overlooking the ocean. We return to the mainland by boat, heading to Cockscomb Basin Wildlife Reserve. Southern Belize has a low population density and high forest cover, ideal conditions for one of the world's rarest big cats - the Jaguar. The reserve is the only one of a few throughout the world, and is a protected area designated especially for the protection of this elusive creature. It is thought that the area is home to one the densist populations of Jaguars in the America's. Although we are unlikely to see them their prints are commonly found and numerous other animals make the National Park their home. Staying in the heart of this jungle environment is a unique experience, getting to know both the forest and the local Mopan Maya population that today protect it and benefit from the tourist industry around the park. Today we explore the park and its numerous trails. The park is considered the best inland national park in the country owing in part to the extensive network of trails through out. There are marked trails as short as 15 minutes and as long as four days in length! We intend to explore a number of the trails along the creeks and rivers as well as climbing to view points that offer stunning views of the expanse of green tropical forest throughout this mountainous area. In the evening we will explore by night through this enchanting location. As we walk we will be looking for the wildlife hiding amongst the vegetation and searching for jaguar footprints. We leave the park this morning and head towards Belize City to take a water taxi to Caye Caulker. Once a pirate lair, this tiny but enchanting tropical island lies 34km northeast of Belize City and about 1.6km inside the greatest barrier reef in the western hemisphere. The water taxi transfer takes about an hour and is a highlight in itself, speeding through the turquoise waters. The island remains uncrowded and unluxurious, with relatively modest prices in restaurants and bars, owned and run by the friendliest of local people. The local fishermen catch lobster, conch, fish and crab to supply the domestic and foreign markets, so fresh seafood is readily available. (Lobster is the best buy when in season from Jun to Feb). There's time to relax - our hotel has a small beach with can accommdate volley ball and basketball courts. The location is ideal to enjoy a number of optional trips. You may take a snorkelling trip out to the nearby Hol Chan Marine Reserve & 'Shark and Ray Alley', or take a full day trip out to Swallow Caye to observe the manatees in their natural mangrove habitat. Scuba diving is also available. (All optional). A free day to do as much or as little as you wish, and enjoy the relaxed atmosphere of Caye Caulker.The island remains uncrowded and unluxurious, and the local fishermen catch lobster, conch, fish and crab to supply domestic and foreign markets. It's a popular place with backpackers, so there is a proliferation of good, reasonably priced restaurants. There's time to relax or enjoy a number of optional trips. You may take a snorkelling trip out to the nearby Hol Chan Marine Reserve and Shark and Ray Alley, or take a full-day trip out to the Manatee Reserve to observe manatee in their natural mangrove habitat. Scuba diving is also available. Another free day to relax or enjoy the optional activities available. Caye Caulker is surrounded by coral reefs and excellent swimming and snorkelling opportunities along the reef. You may like to take one of the free sea kayaks from the hotel to explore mangrove forests rich with birdlife, alternatively it's possible to hire bikes to explore the island at your own leisure taking in the fine views of the crystal clear Caribbean ocean, coral sand beaches and swaying palm trees. For those looking to kick back and relax the hotel has a fine beach front location with stunning views of the Caribbean Sea. Today we return in the morning to Belize City by water taxi, where our tour ends. Bring lightweight, informal clothing suitable for jungle activities. A jumper or fleece is advisable for cool evenings and you'll need a good lightweight waterproof jacket all year round or a poncho or small umbrella. Long sleeved shirtsnorkel shirt and long trousers give protection against thick forest growth and insects on jungle walks. A swimming costume and sun hat are essential. Insect repellent, a torch, water bottle, and suncream. Binoculars are essential for bird and animal watching. For this we suggest US$40 per family member. Our first few days' accommodation in Belize is located on the shores of the Crooked Tree Lagoon in one of the oldest European settlements in Belize. This area is rich in wildlife and especially birds. All of the rooms are ensuite and have air conditioning and fans with included meals served at the lodge. We then head to the Cassia Hill Resort situated ten minutes from the lively town of San Ignacio. The resort features a number of individually well-appointed bungalows each containing a combination of 1 double and 1 single bed with en suite bathrooms. All units are fully air conditioned and have ceiling fans, flat screen TV's and hammocks on the balcony with fine views of the lush rolling hills of the Maya Mountains and San Ignacio. The hotel is set in manicured tropical gardens with a swimming pool, outdoor bar and dining area. Days 7 and 8 are on the tropical island of Tobacco Caye where we stay in a beach hut located right next to the Caribbean Sea which is just a few feet away from your room! Rooms offer views of the great barrier reef and Caribbean sea and contain a private bathroom, electric fan and a deck with chairs and a hammock. The hotel offers a beach volleyball court and free use of kayaks, paddle boards a pedal boat and snorkel gear. There is wi-fi in the main reception area. Our most basic and adventurous accommodation is in the Cockscomb Basin Jaguar Reserve on Days 9 and 10 which is a protected area that is thought to have one of the densest populations of cat species in the America's. Our accommodation is in bunk houses deep within the forest at the parks head-quarters. The lodge has a number of rooms which have three bunk beds per room with shared facilities. While in the jungle, local Mayan ladies cook delicious meals in the kitchen while we explore the forest, rivers and waterfalls. We then drive back to Belize City, using the local water taxi, to the Coral Caye Island of Caye Caulker. This charming island is 32 miles north east of Belize City and just a mile away from the breaking waves on the world's second longest barrier reef. Our hotel for three nights is set in a quiet location with a private beach and complete with hammocks, sun loungers, a thatched shade area, beach volley ball and a basketball court. A pier leads to deeper water which is ideal for cooling off or perhaps fishing. All rooms have fridges and microwaves, ensuite facilities, air conditioning and fans, balconies and outside seating. A perfect location for the end of the tour and to relax at the beach or take snorkelling excursions before returning by water tax to Belize City. Belize: Visas are not required for UK, New Zealand, Australian, US and Canadian citizens. Guatemala: Visas are not required for UK, New Zealand, Australian, US and Canadian citizens. Other nationalities should consult the relevant consulate. You should confirm all visa related issues with the relevant Embassy prior to departure. Beach time: A highlight of our Family Belize Adventure are the four nights we spend on two tropical islands along the way. 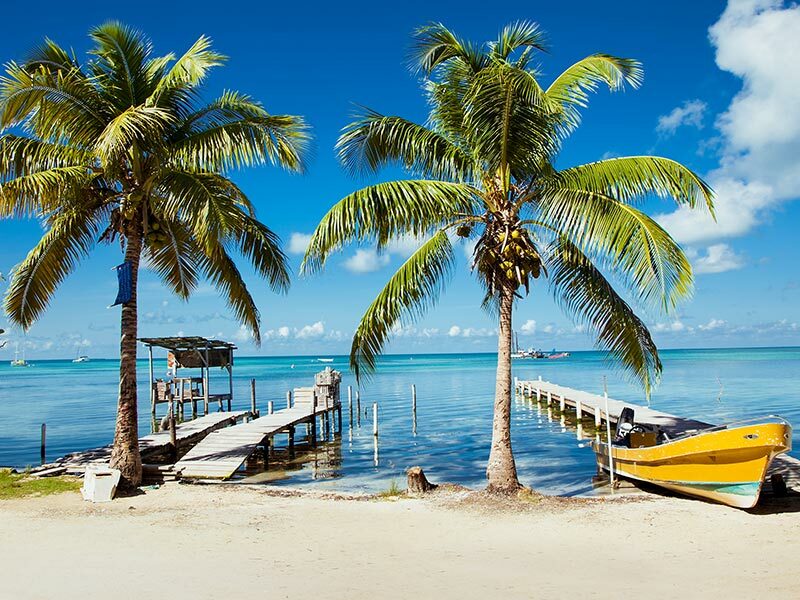 Our first island is Tobacco Caye, a picture postcard island located just 12 miles from the coast. We stay at Joe Jo's By The Reef in cabins right on the beach, a truly fantastic property which gets great reviews and has an ideal location to explore the island. Our second island stop at the end of the trip is Caye Caulker known for its fine beaches, laid back atmosphere, good snorkelling and diverse birdlife. A perfect spot to spend quality family time together and kick back and relax before your flight home. Average Age: As a guide we have identified the actual average age of the children who have travelled on this trip over the last 5 years, to help you decide whether it's the right one for your family. The average age on this trip is 13 years old, this trip is suitable for children of all ages from 7 upwards. Belize is now one of the world's leading ecotourism destinations, offering swathes of untouched rainforest, mangrove coasts, and one of the most splendid coral reef in the western hemisphere, second only in size and grandeur to Australia's Great Barrier Reef. Add to that ancient monuments (over 900 ancient Mayan ruins are located in the country) and fantastic beaches and you have an ideal family adventure destination. Experience the historic and living culture of the Maya as we travel through jungles to discover ancient pyramids, visit local markets, stay on tropical islands and jungle lodges and appreciate its magnificent and well preserved natural history. We include two tropical islands on this trip. On the Caribbean Island of Caye Caulker, we have the opportunity to relax and snorkel with a wide variety of marine life including stingrays and turtles on the largest barrier reef in the western hemisphere. We also spend a night on Tobacco Caye, staying in delightful rustic beach front cabins where you can wake up to the sound of the ocean breaking, a perfect way to wrap up a memoriable family adventure.